Obama and Clinton ads both claim all Americans would be covered by their health plans. Clinton’s would come close. Obama is being misleading when he says his proposal would “cover everyone.” It would make coverage available to all, but experts we consulted estimate that 15 million to 26 million wouldn’t take it up unless required to do so. Clinton stretches things a bit, too. Even her plan – which, unlike Obama’s, includes a mandate for individuals to get insurance – would leave out a million people or perhaps more, depending on how severe the penalties would be for those who don’t comply. She won’t say how her mandate would be enforced, but has said that she was open to the possibility of garnishing wages. Update, Feb. 15: A new Obama ad in Wisconsin misrepresents the words of former Labor Secretary Robert Reich, falsely claiming he said the Obama plan produced greater savings than the Clinton plan. Experts also are skeptical of both candidates’ claims that their plans will reduce the cost of insurance for the typical family by $2,000 or more. ” I know zero credible evidence to support that conclusion,” says M.I.T’s Jonathan Gruber. Behind the dueling ads there is a legitimate disagreement. Obama is reluctant to force people to buy health insurance they don’t want even if the government makes it available at a subsidized price. And Clinton says that any proposal that doesn’t aim to cover 100 percent of the uninsured would be “nibbled to death” by opponents. Experts say the health care plans put forth by Democratic presidential candidates Hillary Clinton and Barack Obama are very similar – and Obama himself has said his proposal has 95 percent in common with hers. But that other 5 percent is a source of contention. Narrator: If you believe health care is America’s moral obligation, join her, Tuesday. Hillary Clinton. Clinton: I’m Hillary Clinton and I approve this message. In recent ads and appearances, Clinton has said that her plan would provide “universal” health care coverage and Obama’s would not. Obama has countered that his plan is “universal” too. The disagreement has played out in dueling television ads. A Clinton ad airing in Wisconsin and Texas says, “She’s the only candidate for president with a plan to provide health care for every American.” An Obama ad that has run in those same states, as well as in Ohio, features the candidate saying he has a plan to “cover everyone,” with the words “universal coverage for all Americans” in a full-screen graphic. The debate between the candidates hinges on the major difference in their proposals: Clinton’s includes an individual mandate that would require everyone to obtain health insurance; Obama’s plan only mandates that children have it.Which one would cover everyone? Studies and experts say an individual mandate would lead to universal or near universal coverage and a plan without such a mandate would cover substantially less of the currently uninsured. Obama: But unless we stop the bickering and the lobbyists, we’ll be in the same place 20 years from now. I’m Barack Obama and I approve this message because to fix health care, we have to fix Washington. if penalties are strong … the mandate is likely to be close to universal.” Clinton has not stated what the enforcement mechanism would be under her plan, and she has been evasive when responding to questions on this point. However, she recently said, after much prodding, that garnishing wages was a possibility, along with automatic enrollments or some measure through the tax system. Sheils at The Lewin Group says evaluations his organization has done, including one recently in Colorado and a national analysis for The Commonwealth Fund, have yielded similar results. He says a plan with subsidies and an individual mandate could cover 90 percent-plus of the currently uninsured, while one without the mandate could reach about 40 percent. Sheils bumps that estimate up to about 45 percent for Obama’s plan when considering the candidate’s mandate for covering children. (Nine million of the uninsured are kids, and a requirement that they be covered could lead to some adults picking up coverage, too. )Both of these experts give similar reasons for why a plan without a mandate would not lead to universal coverage. Affordability is not the only barrier to health care. Even when very generous subsidies are offered, people don’t always take advantage of them. Sheils and Gruber immediately point to the number of people eligible, but not signed up, for Medicaid or the State Children’s Health Insurance Program, which are free in almost all cases. Sheils estimates about 25 percent to 30 percent of those eligible for such government programs don’t enroll. More concrete numbers are available for children: Among the 9 million uninsured children, 74 percent are eligible for Medicaid or SCHIP, according to the Kaiser Family Foundation. Kaiser cites a lack of awareness and difficulty applying for these programs as reasons parents don’t enroll their kids. Narrator: After 18 debates, with two more coming, Hillary says Barack Obama’s ducking debates? It’s the same old politics of phony charges and false attacks.On health care, even Bill Clinton’s own labor secretary says Obama covers more people than Hillary, and does more to cut costs, saving twenty-five hundred dollars for the typical family. Obama’s housing plan? It stems foreclosures and cracks down on crooked lenders. That’s change we can believe in. Update, Feb. 15: This section was added after our original item was posted.The Obama campaign released a new ad Feb. 14 in Wisconsin called “Debate,” quoting Bill Clinton’s first secretary of labor, Robert Reich, as saying Obama’s plan covers “more people” than Clinton’s. We find the ad misleading and, in one respect, false. Reich, Dec. 3, 2007: I’ve compared the two plans in detail. Both of them are big advances over what we have now. But in my view Obama’s would insure more people, not fewer, than HRC’s. That’s because Obama’s puts more money up front and contains sufficient subsidies to insure everyone who’s likely to need help – including all children and young adults up to 25 years old. More recently, however, Reich has not been so emphatic. In a Jan. 13 item he found the plans of Obama and Clinton to be “the same” in almost every important respect. While on Dec. 3 he said he thought Obama’s plan would cover more people because it “puts more money up front,” by Jan. 13 he said that all Democratic plans “spend nearly an identical amount of money.” On the question of whether Clinton or Obama’s position on mandates is best, he said, “Who’s correct? It’s hard to know.” He urged the Democratic candidates to “stop squabbling over healthcare mandates.”Reich did not, however, state in any of his blog items that the Obama plan “does more to cut costs” or that it saves $2,500 for the typical family. Those are claims made by the Obama campaign, not by Reich as the ad falsely claims. And we’re skeptical of the claims that both Clinton and Obama make about the lavish savings their plans would produce, for reasons we get to later in this article. Reich is a professor of public policy and has been in a running feud with another liberal professor, Paul Krugman, a Princeton economist who writes a column for The New York Times and who has been attacking Obama and his health care plan in that space and on his own blog. Reich’s most recent word on the subject, in fact, is headlined “Krugman Still Has it Wrong on Obama’s and Hillary Clinton’s Health Care Plans,” which simply refers readers back to his Jan. 13 posting that says it’s “hard to know” which is best. We note here that both Reich and Krugman are best known for their liberal commentary and neither is a specialist in health care economics. Also, Reich states in his Jan. 13 article that “only around 3% of the population” would be left without health insurance in the absence of mandated coverage for adults. He doesn’t say where he got this figure. We find that hard to reconcile with the hard fact that millions of Americans are currently eligible for cheap health insurance and still don’t sign up for it. As mentioned earlier, for example, about three-quarters of the 9 million uninsured children in the U.S. are eligible for SCHIP or Medicaid, and Gruber estimates that about 7 percent of adults who could get health insurance through an employer don’t take advantage of it. We therefore give more weight to the estimates of Sheils and Gruber than to Reich’s. Aside from the mandate, the candidates’ plans are similar. They differ in details, but both propose to lower health care spending and individual costs through increased efficiency and reduced administrative costs, and both will offer an array of insurance options, including a public plan. Both will expand or revise Medicaid and SCHIP, and both will require insurance companies to provide guaranteed coverage to all. 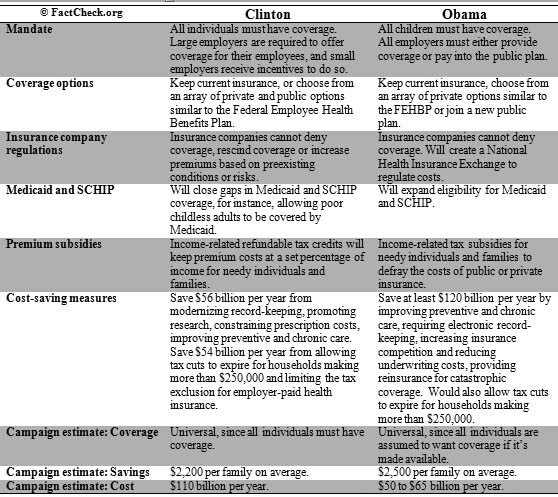 Here’s our comparison of key points:Clinton says that her plan would save $2,200 for the average family. Obama’s campaign requested an analysis from three Harvard professors, who estimated an average savings of $2,500. Both intend to achieve these savings primarily through increased efficiency – electronic medical records and a focus on preventive care are paramount – and curbing incidental administrative expenditures like underwriting and prescription costs. But economics experts aren’t buying it. Sheils calls these estimates “nonsense.” “Your average family’s spending,” he tells FactCheck, “should be around $4,500 out of pocket on their premiums and expenditures; $2,500 would be over 50 percent of that. … It’s just outrageous that you could claim you’d knock 50 percent right off the top.” Sheils points out that preventive care and electronic medical records, two sources of such savings, are already major projects: “All you could do is accelerate it, and you can’t credit the presidential candidate for all of the savings that come from something that would’ve happened anyway.” He acknowledges that other proposed efficiency innovations, like improved clinical effectiveness research – determining the relative usefulness of various treatments – could have an impact on costs, but warns that new guidelines would encounter resistance from doctors and require serious policy overhauls. To be sure, not all are so skeptical. Kenneth E. Thorpe, professor of health policy at Emory University, says that both candidates’ overall savings estimates are “reasonable.” In addition to the savings for individual premiums, both campaigns estimate that their plans will save $110 billion to $200 billion per year in health care spending. “It sounds like a big number, but they’re really not that big,” Thorpe told us, pointing out that total health care spending in the U.S. is $2.2 trillion a year. Obama’s and Clinton’s estimates are about 5 percent to 10 percent of that. As for the price tag: Clinton estimates that her plan will cost $110 billion per year, and Obama’s Harvard analysts put the cost for his plan at $50 billion to $65 billion annually. Both candidates propose to defray these costs primarily by rolling back the tax cuts for those in the top income brackets. The nonpartisan Tax Policy Center estimates that such a rollback, in conjunction with other measures like revising the estate tax, could save roughly $140 billion per year – meaning that if the cost estimates are realistic, the method of paying for them may be realistic as well. But since both plans are lacking details – for instance, neither candidate has said how big the tax credits or subsidies would be, or how many people would qualify – it’s tough to gauge just how feasible the dollar projections are. – by Lori Robertson and Jess HenigCorrection, Feb. 18: We twice say in this article that Gruber estimates 7 percent of those with access to employer-sponsored health insurance don’t take it. Originally, our second reference to this statistic said the figure was 7 million, instead of 7 percent. We have corrected the error. Gruber, Jonathan. “Covering the Uninsured in the U.S.” National Bureau of Economic Research, Jan. 2008.Kaiser Commission on Medicaid and the Uninsured. “Enrolling Uninsured Low-Income Children in Mediaid and SCHIP.” Kaiser Family Foundation, Jan. 2007.Gruber, Jonathan and Ebonya Washington. “Subsidies to employee health insurance premiums and the health insurance market.” Journal of Health Economics, 24(2), 2005 March: 253-276.”This Week with George Stephanopoulos.” Sunday Headliner; Senator Hillary Clinton. ABC News transcript, 3 Feb. 2008. David and David Cutler and Jeffrey Liebman. “Final Costs Memo,” 29 May 2007.Robert Reich, “Why is HRC stooping So Low?” Robert Reich’s Blog 3 Dec 2007. Robert Reich, “Democrats Should Stop Squabbling Over Healthcare Mandates,” Robert Reich’s Blog 13 Jan 2008. Robert Reich, “Krugman Still Has it Wrong on Obama’s and Hillary Clinton’s Health Care Plans” Robert Reich’s Blog 13 Jan 2008. No statements made of whole cloth, but some factual embroidery by Clinton and Obama. Obama mailer on Clinton health care plan lacks context. Clinton and Obama make an agree-athon of the final Democratic debate. Who lands a clean punch? Edwards was there, too. This entry was posted on Wednesday, February 27th, 2008 at 6:02 pm and is filed under barack, barack obama, clinton, democratic primary, hillary, hillary clinton, obama, obama '08, obambi. You can follow any responses to this entry through the RSS 2.0 feed. Responses are currently closed, but you can trackback from your own site.